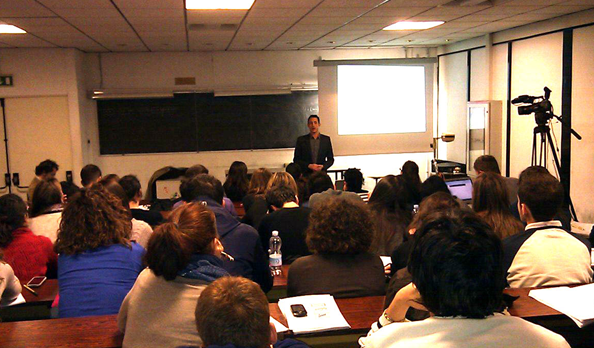 Filippo Berto at a lesson of web 2.0 at the Sapienza University. Filippo Berto had the opportunity to present the business case Berto Salotti to the students of the course of Technologies Applied to Business Communication at the University of Rome. The course taught by Professor Stefano Epifani is very innovative and aims to provide a structured overview of the communication technologies for the enterprise management. The aim of the course is to put participants in the condition of understanding the role of digital communication technologies in the current social and economic context. In this context, we discuss such issues as The role of technology in business communication, The phenomenon of technological convergence and market, The models of multi-channel communication, Social networks and their impact on communication processes, Web 2.0 and its models of service and Enterprise 2.0 In his presentation Filippo Berto explained how, thanks to the Internet and network communication, it was possible to exploit and capitalize on what has been done in the first generation, with the brothers Carlo and Fioravante Berto, relating it with the growing number of interlocutors.